A pheochromocytoma (see the image below) is a rare, catecholamine-secreting tumor that may precipitate life-threatening hypertension. The tumor is malignant in 10% of cases but may be cured completely by surgical removal. Although pheochromocytoma has classically been associated with 3 syndromes—von Hippel-Lindau (VHL) syndrome, multiple endocrine neoplasia type 2 (MEN 2), and neurofibromatosis type 1 (NF1)—there are now 10 genes that have been identified as sites of mutations leading to pheochromocytoma. Axial, T2-weighted magnetic resonance imaging (MRI) scan showing large left suprarenal mass of high signal intensity on a T2-weighted image. The mass is a pheochromocytoma. A pheochromocytoma is a rare, catecholamine-secreting tumor derived from chromaffin cells. The term pheochromocytoma (in Greek, phios means dusky, chroma means color, and cytoma means tumor) refers to the color the tumor cells acquire when stained with chromium salts. About 85% of pheochromocytomas are located within the adrenal glands, and 98% are within the abdomen. When such tumors arise outside of the adrenal gland, they are termed extra-adrenal pheochromocytomas, or paragangliomas. Approximately 10% of pheochromocytomas and 35% of extra-adrenal pheochromocytomas are malignant. Only the presence of metastases defines malignancy. However, specific histologic features help to differentiate adrenal pheochromocytomas with a potential for biologically aggressive behavior from those that behave in a benign fashion. Among the features that suggest a malignant course are large tumor size and an abnormal DNA ploidy pattern (aneuploidy, tetraploidy). Common metastatic sites include bone, liver, and lymph nodes. Pheochromocytoma is diagnosed by measuring elevated levels of metanephrines (catecholamine metabolites) in blood or urine. CT scanning or MRI is the preferred technique for localizing pheochromocytomas (see the image below). Surgical resection of the tumor is the treatment of choice and usually cures the hypertension (see Workup and Treatment). For discussion of pheochromocytoma in children, see the Medscape Reference article Pediatric Pheochromocytoma. For patient education information, see High Blood Pressure. Catecholamine secretion in pheochromocytomas is not regulated in the same manner as in healthy adrenal tissue. Unlike the healthy adrenal medulla, pheochromocytomas are not innervated, and catecholamine release is not precipitated by neural stimulation. The trigger for catecholamine release is unclear, but multiple mechanisms have been postulated, including direct pressure, medications, and changes in tumor blood flow. Relative catecholamine levels also differ in pheochromocytomas. Most pheochromocytomas secrete norepinephrine predominantly, whereas secretions from the normal adrenal medulla are roughly 85% epinephrine. Although the majority of pheochromocytomas are sporadic, approximately 30% result from inherited mutations. To date, 10 genes associated with pheochromocytoma and paraganglioma have been identified. Familial syndromes associated with pheochromocytomas include MEN 2A and 2B, neurofibromatosis (von Recklinghausen disease), and VHL disease, as well as others. The MEN 2A and 2B syndromes have been traced to germline mutations in the ret proto-oncogene on chromosome 10, which encodes a tyrosine kinase receptor involved in the regulation of cell growth and differentiation. Pheochromocytomas occur bilaterally in the MEN syndromes in as many as 70% of cases. Over 95% of cases of MEN 2A are associated with mutations in the ret proto-oncogene affecting 1 of 5 codons, located in exon 10 (codons 609, 611, 618, 620) and exon 11 (codon 634). Patients with MEN 2B may also have ganglioneuromatosis of the gastrointestinal (GI) tract, which can cause functional GI problems. A germline missense mutation in the tyrosine kinase domain of the ret proto-oncogene (exon 16, codon 918) has been reported to be present in 95% of patients with MEN 2B. Clinical diagnosis of MEN 2B is based on the presence of mucosal neuromas of the oral mucosa, enlarged lips with characteristic facial appearance, and marfanoid habitus. Medullary thyroid carcinoma is virtually assured with MEN 2B, and the risk of pheochromocytoma is 50%. Parathyroid disease is uncommon with MEN 2B. Persons diagnosed with MEN 2B should have a prophylactic thyroidectomy in infancy because of the early and aggressive nature of associated medullary thyroid carcinoma. A number of other genes, such as the GDNF gene, are associated with development of adrenal or extra-adrenal pheochromocytomas. The GDNF gene is also associated with central hypoventilation syndrome and susceptibility to Hirschsprung disease. The TMEM127 gene also is associated with susceptibility to pheochromocytoma. Several families have been described with unique mutations to this gene that have resulted in the development of pheochromocytoma between young adulthood and middle age. All of these are inherited in an autosomal dominant fashion with incomplete penetrance. VHL disease is caused by mutations in the VHL gene. This gene encodes a protein that plays a role in cilia formation, regulation of cellular senescence, and the oxygen-sensing pathway. Neurofibromatosis, or von Recklinghausen disease, is characterized by congenital anomalies (often benign tumors) of the skin, nervous system, bones, and endocrine glands. Only 1% of patients with neurofibromatosis have been found to have pheochromocytomas, but as many as 5% of patients with pheochromocytomas have been found to have neurofibromatosis. Other neuroectodermal disorders associated with pheochromocytomas include tuberous sclerosis (Bourneville disease, epiloia) and Sturge-Weber syndrome. Pheochromocytomas may produce calcitonin, opioid peptides, somatostatin, corticotropin, and vasoactive intestinal peptide. Corticotropin hypersecretion has caused Cushing syndrome, and vasoactive intestinal peptide overproduction causes watery diarrhea. The succinate dehydrogenase complex subunit D protein is encoded by the SDHD gene, mutations in which cause pheochromocytomas, paragangliomas, and other tumors. In most tumors, inheritance of the mutation is autosomal dominant with biallelic expression of the SDHD gene. However, paternal imprinting appears to be the inheritance pattern in paragangliomas and, in particular, carotid body tumors resulting from the SDHD gene. The succinate dehydrogenase complex subunit B protein is encoded by the SDHB gene. Mutations in this gene are known to cause carotid body tumors and paragangliomas and are inherited in an autosomal dominant fashion. Paragangliomas caused by SDHB mutations have a higher rate of malignant transformation that those that are not. The succinate dehydrogenase subunit C protein is encoded by the SDHC gene, and mutations are known to cause paraganglioma. One family with a mutation in this gene showed maternal inheritance of the condition,  but subsequent investigation has suggested an autosomal dominant inheritance pattern without evidence of imprinting. Hemihyperplasia can be caused by paternal uniparental disomy for the 11p15 chromosomal region, as can be seen in isolated hemihyperplasia and Beckwith-Wiedemann syndrome. Methylation of the LIT1 and H19 genes is important to the pathogenesis of hemihyperplasia and underscores the importance of epigenetics in normal growth and in the development of neoplasia. Pheochromocytomas occur in people of all races, although they are diagnosed less frequently in blacks. Pheochromocytomas may occur in persons of any age, but the peak incidence is from the third to the fifth decades of life. Approximately 10% occur in children. Fifty percent of pheochromocytomas in children are solitary intra-adrenal lesions, 25% are present bilaterally, and 25% are extra-adrenal. The 5-year survival rate for people with nonmalignant pheochromocytomas is greater than 95%. In patients with malignant pheochromocytomas, the 5-year survival rate is less than 50%. Although pheochromocytomas are rare, making the diagnosis is critical because the malignancy rate is 10%, pheochromocytomas may be associated with a familial syndrome, they may precipitate life-threatening hypertension, and the patient may be cured completely with their removal. A pheochromocytoma-induced hypertensive crisis may precipitate hypertensive encephalopathy, which is characterized by altered mental status, focal neurologic signs and symptoms, or seizures. Other neurologic complications include stroke from cerebral infarction or an embolic event secondary to a mural thrombus from dilated cardiomyopathy. Intracerebral hemorrhage also may occur, because of uncontrolled hypertension. Pheochromocytoma during pregnancy is extremely rare (0.002% of all pregnancies),  but undiagnosed pheochromocytoma that occurs during pregnancy carries a grave prognosis, with maternal and fetal mortality rates of 48% and 55%, respectively. However, maternal mortality is virtually eliminated and the fetal mortality rate is reduced to 15% if the diagnosis is made antenatally. Waguespack SG, Rich T, Grubbs E, Ying AK, Perrier ND, Ayala-Ramirez M, et al. A current review of the etiology, diagnosis, and treatment of pediatric pheochromocytoma and paraganglioma. J Clin Endocrinol Metab. 2010 May. 95(5):2023-37. [Medline]. Sheps SG, Jiang NS, Klee GG, van Heerden JA. Recent developments in the diagnosis and treatment of pheochromocytoma. Mayo Clin Proc. 1990 Jan. 65(1):88-95. [Medline]. Yeterian EH, Pandya DN. Corticothalamic connections of the superior temporal sulcus in rhesus monkeys. Exp Brain Res. 1991. 83(2):268-84. [Medline]. Elenkova A, Matrozova J, Zacharieva S, Kirilov G, Kalinov K. Adiponectin - A possible factor in the pathogenesis of carbohydrate metabolism disturbances in patients with pheochromocytoma. Cytokine. 2010 Jun. 50(3):306-10. [Medline]. Därr R, Lenders JWM, Hofbauer LC, Naumann B, Bornstein SR, Eisenhofer G. Pheochromocytoma: Update on Disease Management. Ther Adv in Endo and Metab. 2012;3(1):11-26. [Full Text]. Thompson LD. Pheochromocytoma of the Adrenal gland Scaled Score (PASS) to separate benign from malignant neoplasms: a clinicopathologic and immunophenotypic study of 100 cases. Am J Surg Pathol. 2002 May. 26(5):551-66. [Medline]. Bholah R, Bunchman TE. Review of Pediatric Pheochromocytoma and Paraganglioma. Front Pediatr. 2017. 5:155. [Medline]. [Full Text]. Eisenhofer G, Pacak K, Huynh TT, Qin N, Bratslavsky G, Linehan WM, et al. Catecholamine metabolomic and secretory phenotypes in phaeochromocytoma. Endocr Relat Cancer. 2011 Feb. 18(1):97-111. [Medline]. Ferreira VM, Marcelino M, Piechnik SK, et al. Pheochromocytoma Is Characterized by Catecholamine-Mediated Myocarditis, Focal and Diffuse Myocardial Fibrosis, and Myocardial Dysfunction. J Am Coll Cardiol. 2016 May 24. 67 (20):2364-74. [Medline]. [Full Text]. Eisenhofer G, Lenders JW, Timmers H, Mannelli M, Grebe SK, Hofbauer LC, et al. Measurements of plasma methoxytyramine, normetanephrine, and metanephrine as discriminators of different hereditary forms of pheochromocytoma. Clin Chem. 2011 Mar. 57(3):411-20. [Medline]. [Full Text]. Eisenhofer G, Rivers G, Rosas AL, Quezado Z, Manger WM, Pacak K. Adverse drug reactions in patients with phaeochromocytoma: incidence, prevention and management. Drug Saf. 2007. 30(11):1031-62. [Medline]. Eng C. Seminars in medicine of the Beth Israel Hospital, Boston. The RET proto-oncogene in multiple endocrine neoplasia type 2 and Hirschsprung's disease. N Engl J Med. 1996 Sep 26. 335(13):943-51. [Medline]. Comino-Mendez I, Gracia-Aznarez FJ, Schiavi F, Landa I, et al. Exome sequencing identifies MAX mutations as a cause of hereditary pheochromocytoma. Nat Genet. 2011 Jun 19. 43(7):663-7. [Medline]. Burnichon N, Cascon A, Schiavi F, Morales NP, Comino-Mendez I, et al. MAX mutations cause hereditary and sporadic pheochromocytoma and paraganglioma. Clin Cancer Res. 2012 May 15. 18(10):2828-37. [Medline]. Neumann HP, Berger DP, Sigmund G, Blum U, Schmidt D, Parmer RJ, et al. Pheochromocytomas, multiple endocrine neoplasia type 2, and von Hippel-Lindau disease. N Engl J Med. 1993 Nov 18. 329(21):1531-8. [Medline]. Gergics P, Patocs A, Toth M, Igaz P, Szucs N, Liko I, et al. Germline VHL gene mutations in Hungarian families with von Hippel-Lindau disease and patients with apparently sporadic unilateral pheochromocytomas. Eur J Endocrinol. 2009 Sep. 161(3):495-502. [Medline]. Niemann S, Becker-Follmann J, Nurnberg G, Ruschendorf F, Sieweke N, et al. Assignment of PGL3 to chromosome 1 (q21-q23) in a family with autosomal dominant non-chromaffin paraganglioma. Am J Med Genet. 2001 Jan 1. 98(1):32-6. [Medline]. Burnichon N, Briere JJ, Libe R, Vescovo L, Riviere J, et al. SDHA is a tumor suppressor gene causing paraganglioma. Hum Mol Genet. 2010 Aug 1. 19(15):3011-20. [Medline]. [Full Text]. Kunst HP, Rutten MH, de Mönnink JP, Hoefsloot LH, Timmers HJ, Marres HA, et al. SDHAF2 (PGL2-SDH5) and hereditary head and neck paraganglioma. Clin Cancer Res. 2011 Jan 15. 17(2):247-54. [Medline]. van den Akker EL, de Krijger RR, de Herder WW, Drop SL. Congenital hemihypertrophy and pheochromocytoma, not a coincidental combination?. Eur J Pediatr. 2002 Mar. 161(3):157-60. [Medline]. Beard CM, Sheps SG, Kurland LT, Carney JA, Lie JT. Occurrence of pheochromocytoma in Rochester, Minnesota, 1950 through 1979. Mayo Clin Proc. 1983 Dec. 58(12):802-4. [Medline]. Young WF Jr. Clinical practice. The incidentally discovered adrenal mass. N Engl J Med. 2007 Feb 8. 356(6):601-10. [Medline]. Berends AMA, Buitenwerf E, de Krijger RR, et al. Incidence of pheochromocytoma and sympathetic paraganglioma in the Netherlands: A nationwide study and systematic review. Eur J Intern Med. 2018 Jan 17. [Medline]. Hamidi O, Young WF Jr, Gruber L, et al. Outcomes of patients with metastatic phaeochromocytoma and paraganglioma: a systematic review and meta-analysis. Clin Endocrinol (Oxf). 2017 Jul 26. [Medline]. Dhir M, Li W, Hogg ME, et al. Clinical Predictors of Malignancy in Patients with Pheochromocytoma and Paraganglioma. Ann Surg Oncol. 2017 Sep 7. [Medline]. Parikh PP, Rubio GA, Farra JC, Lew JI. Nationwide review of hormonally active adrenal tumors highlights high morbidity in pheochromocytoma. J Surg Res. 2017 Jul. 215:204-10. [Medline]. Boulkina LS, Newton CA, Drake AJ 3rd, Tanenberg RJ. Acute myocardial infarction attributable to adrenergic crises in a patient with pheochromocytoma and neurofibromatosis 1. Endocr Pract. 2007 May-Jun. 13(3):269-73. [Medline]. Lenders JW. Pheochromocytoma and pregnancy: a deceptive connection.Eur J Endocrinol. 2012 Feb;166(2):143-50. Epub 2011 Sep 2. Prejbisz A, Lenders JW, Eisenhofer G, Januszewicz A. Cardiovascular manifestations of phaeochromocytoma. J Hypertens. 2011 Nov. 29(11):2049-60. [Medline]. La Batide-Alanore A, Chatellier G, Plouin PF. Diabetes as a marker of pheochromocytoma in hypertensive patients. J Hypertens. 2003 Sep. 21(9):1703-7. [Medline]. Gagnon N, Mansour S, Bitton Y, Bourdeau I. TAKOTSUBO-LIKE CARDIOMYOPATHY IN A LARGE COHORT OF PATIENTS WITH PHEOCHROMOCYTOMA AND PARAGANGLIOMA. Endocr Pract. 2017 Jul 13. [Medline]. Tucker ME. Endocrine Society first to address rare adrenal-tumor care. Medscape Medical News. June 5, 2014. [Full Text]. Lenders JW, Duh QY, Eisenhofer G, Gimenez-Roqueplo AP, Grebe SK, Murad MH, et al. Pheochromocytoma and paraganglioma: an endocrine society clinical practice guideline. J Clin Endocrinol Metab. 2014 Jun. 99(6):1915-42. [Medline]. Chen Y, Xiao H, Zhou X, et al. ACCURACY OF PLASMA FREE METANEPHRINES IN THE DIAGNOSIS OF PHEOCHROMOCYTOMA AND PARAGANGLIOMA: A SYSTEMATIC REVIEW AND META-ANALYSIS. Endocr Pract. 2017 Jul 13. [Medline]. [Guideline] Chen H, Sippel RS, O'Dorisio MS, Vinik AI, Lloyd RV, Pacak K. The North American Neuroendocrine Tumor Society consensus guideline for the diagnosis and management of neuroendocrine tumors: pheochromocytoma, paraganglioma, and medullary thyroid cancer. Pancreas. 2010 Aug. 39(6):775-83. [Medline]. [Full Text]. Lenders JW, Pacak K, Walther MM, Linehan WM, Mannelli M, Friberg P, et al. Biochemical diagnosis of pheochromocytoma: which test is best?. JAMA. 2002 Mar 20. 287(11):1427-34. [Medline]. de Jong WH, Eisenhofer G, Post WJ, Muskiet FA, de Vries EG, Kema IP. Dietary influences on plasma and urinary metanephrines: implications for diagnosis of catecholamine-producing tumors. J Clin Endocrinol Metab. 2009 Aug. 94(8):2841-9. [Medline]. Jimenez C, Cote G, Arnold A, Gagel RF. Review: Should patients with apparently sporadic pheochromocytomas or paragangliomas be screened for hereditary syndromes?. J Clin Endocrinol Metab. 2006 Aug. 91(8):2851-8. [Medline]. Eisenhofer G, Goldstein DS, Walther MM, Friberg P, Lenders JW, Keiser HR, et al. Biochemical diagnosis of pheochromocytoma: how to distinguish true- from false-positive test results. J Clin Endocrinol Metab. 2003 Jun. 88(6):2656-66. [Medline]. Lenders JW, Pacak K, Huynh TT, Sharabi Y, Mannelli M, Bratslavsky G, et al. Low sensitivity of glucagon provocative testing for diagnosis of pheochromocytoma. J Clin Endocrinol Metab. 2010 Jan. 95(1):238-45. [Medline]. [Full Text]. Szolar DH, Korobkin M, Reittner P, Berghold A, et al. Adrenocortical carcinomas and adrenal pheochromocytomas: mass and enhancement loss evaluation at delayed contrast-enhanced CT. Radiology. 2005 Feb. 234(2):479-85. [Medline]. Buitenwerf E, Korteweg T, Visser A, et al. Unenhanced CT imaging is highly sensitive to exclude pheochromocytoma: a multicenter study. Eur J Endocrinol. 2018 Feb 21. [Medline]. Park BK, Kim CK, Kwon GY, Kim JH. Re-evaluation of pheochromocytomas on delayed contrast-enhanced CT: washout enhancement and other imaging features. Eur Radiol. 2007 Nov. 17(11):2804-9. [Medline]. Baid SK, Lai EW, Wesley RA, Ling A, Timmers HJ, Adams KT, et al. Brief communication: radiographic contrast infusion and catecholamine release in patients with pheochromocytoma. Ann Intern Med. 2009 Jan 6. 150(1):27-32. [Medline]. [Full Text]. Bessell-Browne R, O'Malley ME. CT of pheochromocytoma and paraganglioma: risk of adverse events with i.v. administration of nonionic contrast material. AJR Am J Roentgenol. 2007 Apr. 188(4):970-4. [Medline]. Blake MA, Kalra MK, Maher MM, Sahani DV, Sweeney AT, Mueller PR, et al. Pheochromocytoma: an imaging chameleon. Radiographics. 2004 Oct. 24 Suppl 1:S87-99. [Medline]. Faria JF, Goldman SM, Szejnfeld J, Melo H, Kater C, Kenney P, et al. Adrenal masses: characterization with in vivo proton MR spectroscopy--initial experience. Radiology. 2007 Dec. 245(3):788-97. [Medline]. Kim S, Salibi N, Hardie AD, Xu J, Lim RP, Lee VS, et al. Characterization of adrenal pheochromocytoma using respiratory-triggered proton MR spectroscopy: initial experience. AJR Am J Roentgenol. 2009 Feb. 192(2):450-4. [Medline]. Wiseman GA, Pacak K, O'Dorisio MS, Neumann DR, Waxman AD, Mankoff DA, et al. Usefulness of 123I-MIBG scintigraphy in the evaluation of patients with known or suspected primary or metastatic pheochromocytoma or paraganglioma: results from a prospective multicenter trial. J Nucl Med. 2009 Sep. 50(9):1448-54. [Medline]. Fottner C, Helisch A, Anlauf M, Rossmann H, Musholt TJ, Kreft A, et al. 6-18F-fluoro-L-dihydroxyphenylalanine positron emission tomography is superior to 123I-metaiodobenzyl-guanidine scintigraphy in the detection of extraadrenal and hereditary pheochromocytomas and paragangliomas: correlation with vesicular monoamine transporter expression. J Clin Endocrinol Metab. 2010 Jun. 95(6):2800-10. [Medline]. Jacobson AF, Deng H, Lombard J, Lessig HJ, Black RR. 123I-meta-iodobenzylguanidine scintigraphy for the detection of neuroblastoma and pheochromocytoma: results of a meta-analysis. J Clin Endocrinol Metab. 2010 Jun. 95(6):2596-606. [Medline]. Timmers HJ, Kozupa A, Chen CC, Carrasquillo JA, Ling A, Eisenhofer G, et al. Superiority of fluorodeoxyglucose positron emission tomography to other functional imaging techniques in the evaluation of metastatic SDHB-associated pheochromocytoma and paraganglioma. J Clin Oncol. 2007 Jun 1. 25(16):2262-9. [Medline]. Luster M, Karges W, Zeich K, Pauls S, Verburg FA, Dralle H, et al. Clinical value of 18F-fluorodihydroxyphenylalanine positron emission tomography/computed tomography (18F-DOPA PET/CT) for detecting pheochromocytoma. Eur J Nucl Med Mol Imaging. 2010 Mar. 37(3):484-93. [Medline]. Yamamoto S, Hellman P, Wassberg C, Sundin A. 11C-hydroxyephedrine positron emission tomography imaging of pheochromocytoma: a single center experience over 11 years. J Clin Endocrinol Metab. 2012 Jul. 97(7):2423-32. [Medline]. Wong C, Yu R. Preoperative preparation for pheochromocytoma resection: physician survey and clinical practice. Exp Clin Endocrinol Diabetes. 2010 Jul. 118(7):400-4. [Medline]. Kwon SY, Lee KS, Lee JN, et al. Risk factors for hypertensive attack during pheochromocytoma resection. Investig Clin Urol. 2016 May. 57 (3):184-90. [Medline]. [Full Text]. Butz JJ, Yan Q, McKenzie TJ, et al. Perioperative outcomes of syndromic paraganglioma and pheochromocytoma resection in patients with von Hippel-Lindau disease, multiple endocrine neoplasia type 2, or neurofibromatosis type 1. Surgery. 2017 Sep 14. [Medline]. Pravenec M, Kren V, Klír P, Simonet L, Kurtz T. Identification of genes determining spontaneous hypertension. Review article. Sb Lek. 1991 Jun. 93(5-6):136-41. [Medline]. [Full Text]. Scholten A, Vriens MR, Cromheecke GJ, Borel Rinkes IH, Valk GD. Hemodynamic instability during resection of pheochromocytoma in MEN versus non-MEN patients. Eur J Endocrinol. 2011 Jul. 165(1):91-6. [Medline]. Nau P, Demyttenaere S, Muscarella P, Narula V, Hazey JW, Ellison EC, et al. Pheochromocytoma does not increase risk in laparoscopic adrenalectomy. Surg Endosc. 2010 Nov. 24(11):2760-4. [Medline]. Li QY, Li F. Laparoscopic adrenalectomy in pheochromocytoma: retroperitoneal approach versus transperitoneal approach. J Endourol. 2010 Sep. 24(9):1441-5. [Medline]. Scholten A, Valk GD, Ulfman D, Borel Rinkes IH, Vriens MR. Unilateral subtotal adrenalectomy for pheochromocytoma in multiple endocrine neoplasia type 2 patients: a feasible surgical strategy. Ann Surg. 2011 Dec. 254(6):1022-7. [Medline]. Donatini G, Kraimps JL, Caillard C, et al. Pheochromocytoma diagnosed during pregnancy: lessons learned from a series of ten patients. Surg Endosc. 2018 Feb 27. [Medline]. [Guideline] Lenders JW, Duh QY, Eisenhofer G, et al. Pheochromocytoma and paraganglioma: an Endocrine Society clinical practice guideline. J Clin Endocrinol Metab. 2014 Jun. 99 (6):1915-42. [Medline]. [Full Text]. [Guideline] National Comprehensive Cancer Network. NCCN Clinical Practice Guidelines in Oncology: Neuroendocrine Tumors, Version 2.2016. NCCN. May 25, 2016; Accessed: October 2, 2016. Butz JJ, Weingarten TN, Cavalcante AN, et al. Perioperative hemodynamics and outcomes of patients on metyrosine undergoing resection of pheochromocytoma or paraganglioma. Int J Surg. 2017 Aug 10. 46:1-6. [Medline]. Jimenez C, Chin B, Noto R, et al. Azedra (iobenguane I 131) in patients with metastatic and/or recurrent and/or unresectable pheochromocytoma or paraganglioma: biochemical tumor marker results of a multicenter, open-label pivotal phase 2 study (OR02-5). Endocrine Society (ENDO) Annual Meeting. Chicago, IL. 2018 Mar 17. Barone JE. Pheochromocytoma Crisis Is Not a Surgical Emergency. Medscape Medical News. January 18, 2013. Available at http://www.medscape.com/viewarticle/777889. Accessed: January 29, 2013. Scholten A, Cisco RM, Vriens MR, Cohen JK, Mitmaker EJ, Liu C, et al. Pheochromocytoma crisis is not a surgical emergency. J Clin Endocrinol Metab. 2013 Feb. 98(2):581-91. [Medline]. 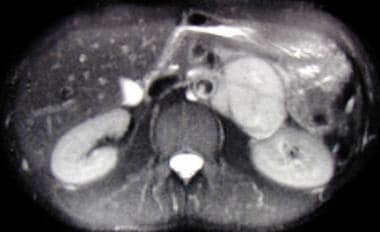 Abdominal computed tomography (CT) scan demonstrating left suprarenal mass of soft-tissue attenuation representing a paraganglioma. Adrenalectomy specimen containing pheochromocytoma. Non-neoplastic adrenal cortex (yellow) surrounds a small tan-red tumor in the medullary region, representing a pheochromocytoma. H and E, high power, showing classic "balls of cells" feature of a pheochromocytoma. Endocrine tumors such as a pheochromocytoma typically show some degree of nuclear pleomorphism ("endocrine atypia") which does not indicate malignancy. Disclosure: Received royalty from Springer for book editor.